As technology becomes more prevalent in the healthcare industry, it is essential for medical practices to adapt to this change. Certainly, electronic patient records, mobile applications, web portals, and remote patient monitoring, open up the opportunity to provide more effective care and build deeper relationships with patients. They can also involve a massive investment of time, a heightened degree of confusion, and the disruption of an agreeable work-life balance. The difference between technology that contributes to a better practice workflow, and technology that creates friction, is smart decisions about which solutions to deploy and careful consideration about how they are implemented within the practice. For most practices, the EHR is the system of record for patient information. It is the heart of the practice’s technology platform. Information may flow into and out of it, but it is the central repository for the most important data. Most EHR systems are fairly complex and can be implemented with a number of features based on the needs of the individual practice. This flexibility is great, but most medical offices do not have an EHR deployment vendor on staff. The technology provider may be helpful in the early stages of deployment, but truly maximizing the workflow is not always included in the scope of what they do. How do you know if your EHR is optimized? Here are a few red flags that indicate it isn’t. What do you do if your EHR is not set up for optimal workflow in your practice? It may be worth considering bringing in an outside consultant who specializes in practice management technology. After all, your staff will probably deploy this type of technology only once or maybe twice in their career. There are experts who do it every day. They can advise you on which modules make sense for your practice, how to integrate third party solutions, and how the most successful offices leverage technology. Practice workflow can be improved substantially if the average patient encounter takes less time. Optimizing the EHR helps a lot, and so does the smart use of remote patient encounters. Fewer people in the office reduces the burden on administrative staff, decreases wait times, and makes each visit more focused and efficient. Telehealth is ideal for follow-up appointments, medication management, family planning, lifestyle coaching, and many other conditions. Patients love the convenience, reduced costs, and time savings. The approach gives each provider a way to increase the revenue they generate without spending more time in the office. It also increases flexibility, making it easy to treat patients when the office isn’t normally open or to conduct encounters from home or elsewhere. We’ve suggested that both the EHR and telehealth platform can be the key to improved work-life balance, but we should point out that integration between them is essential for optimal workflow. A telehealth system that does not send data back and forth to the EHR can lead to the very problems we pointed out before like duplicate data entry, opportunities for error, and mistrust in the quality of the data. In the case of telehealth, tight integration is also essential for verifying that the encounter will be eligible for reimbursement. 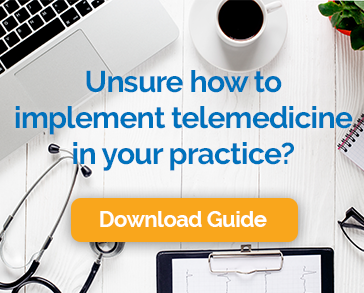 Because the reimbursement rules for telehealth are so complex and depend on the location, the payer, and the patient’s particular plan, the best telemedicine solutions pull in the right information from the EHR. It is then run through a sophisticated algorithm that determines eligibility and allow for the scheduling of video visits only for verified encounters. If you select the right telehealth platform, it will enhance workflow, rather than create additional barriers. Many choices pit the business against the customer. A price increase might be good for the business, but hard for the customer. Additional staffing may be great for the customer, but harmful to the business. Fortunately, when it comes to workflow optimization in healthcare, there is no such trade-off. More efficient use of technology is a win-win. Patients see fewer bottlenecks to getting the care they need and providers and staff use their valuable time in the most efficient way possible. If better use of technology gets you a few hours back in your day, your patients won’t begrudge it at all.